What I want you guys to do is to make a creature with Demigod in its types! Other than that, there's no restriction! Let's see what everyone can come up with! Top 3 winning cards will get a -TROPHY-. I'll decide the deadline when I think there are enough cards to judge. Not per say a demigod, more an extension of a god, but still very close to the god. I have a question. How do I make the text bold like @kauyon did? It is the same as italics when making a card, just replace the i with a b.
Heck yeah I am powerful. That's Crazy! I mean... That's Awesome! I am going to give the link to my set I made for this. I am going to do one for each god, and hopefully they aren't a copy of someone elses. So here you go! These two don't like each other, so they are posted together; you know, for contrast. @Mobin I commented on your Tabitha. Please check it out! 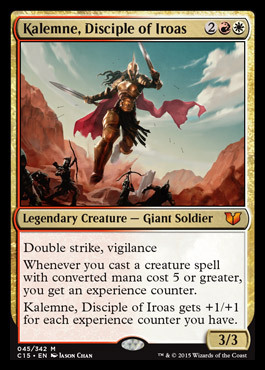 Oh, and here is one of the new commanders. It is a disciple of Iroas, and I think that it works for this contest. Just another one, more made for fun rather than an entry to this contest but eh. @Tomigon I'm working on a cycle of these, I'll put the link here soon.